As an incinerator and non-ferrous works, handling lead as well as silver, gold and other precious metals, we have a responsibility to monitor and manage our environmental performance to a high standard, for the benefit of our customers, employees and the wider community. We take this responsibility very seriously and seek to ensure satisfactory performance by our own internal monitoring programme, and by welcoming Environment Agency and customer audits. 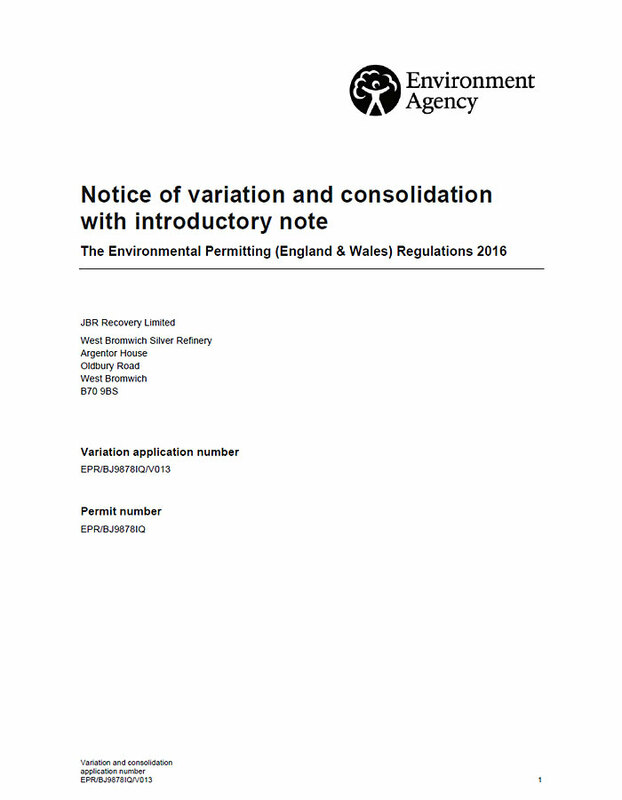 The Environment Agency issues JBR with an Environmental Permit that documents the processes we are authorised to run and the operating conditions we must adhere to in order to control the associated environmental impacts. The Environment Agency periodically visit site to ensure these operating conditions are in place. JBR's Permit number is BJ9878 with the latest issue displayed on the right of this page. ISO 14001 is an international standard for environmental management systems. It is applicable to any organisation that wishes to establish, implement, maintain and improve an environmental management system. JBR have certification to ISO 14001 and have six-monthly audits by British Standards Institute to maintain certification. JBR’s ISO 14001 registration number is EMS 541124 and the certificate is available in the download section of the website. 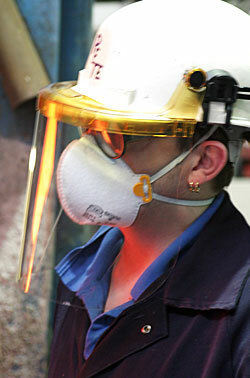 Our Quality, Safety, Health & Environmental Policy is available in the download section of the website. 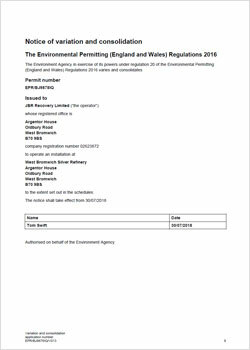 JBR has authorisation from the Environment Agency to import waste materials from outside the UK in accordance with the requirements of the Transfrontier Shipment of Waste Regulations. 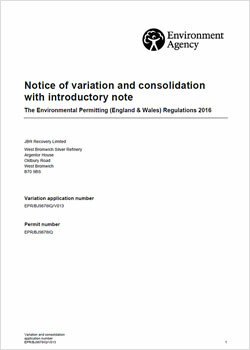 Our Transfrontier Shipment of Waste Pre-Consent authorisation document is available in the download section of the website. 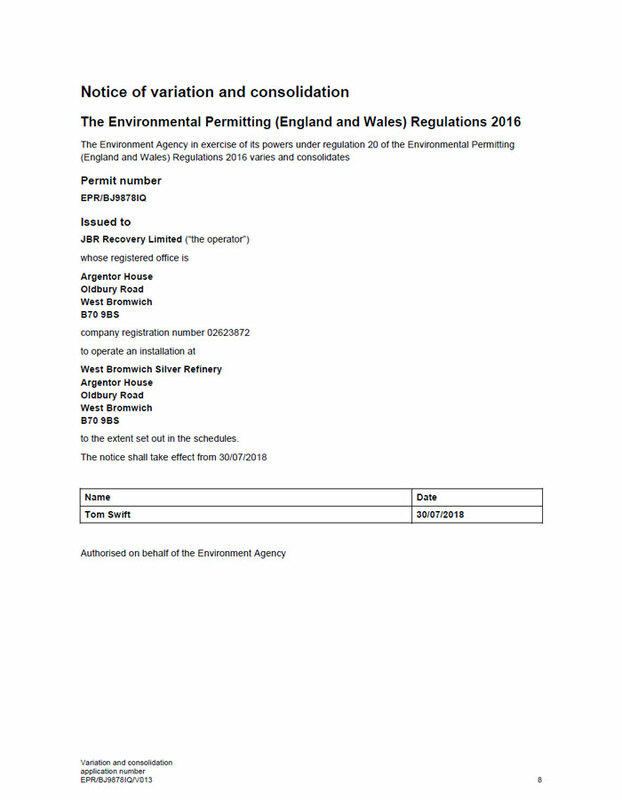 JBR’s Hazardous Waste Registration Number is NIB077, the registration document is available in the download section of the website.